I often read comments and emails from people who talk about liking or wanting to make a dish but they can’t “because my significant other doesn’t like [insert ingredient]!” I have to admit, I am often perplexed. If they want to eat it, why don’t they just make it anyway? But then I look at my own cooking repertoire, and I get it. It’s enough of a pain to make one dish some nights after a long day of work, but to make one only one of you wants to eat? There’s no logic in it. So, I shy away from Things Alex Thinks He Doesn’t Like, such as coconut (sigh), tofu (sigh) and well, this. There is only one chicken salad in the entire world that I like, and my other half? He hates it. Doesn’t like the cranberries, doesn’t like the walnuts and doesn’t know why anyone in their right mind would add such things to an innocent chicken salad. I made it one time three years ago, loved it and had yet to make it since. So, if your ideal salad sounds like my ideal salad, come, pull up a chair, sit down next to me. I made more than enough to go around. Deb and Alex went to Paris and all I got was this lousy chicken salad! Yes, it’s true. Alex and I have flown the coop this week and are (hopefully) wandering around ancient cobblestone streets in a wine and butter-induced haze. Comment responses will be slow–if at all–this week, but I have fortunately been cooking up enough of a storm that you should never be left without your smitten kitchen fix! We’ll be back before you know it. Really complicated directions: Toss together all ingredients in a large bowl until combined well. I like to eat mine on top of chopped Romaine lettuce, or with toasted pocketless pita wedges. Variations: Are almost endless, but this is particularly good with leftover Thanksgiving turkey and chopped pecans. YUM…this is exactly the way I like it! I love, love, love chicken salad. The more various and sundry bits of goodness the better. I feel just like you do about the sweet and the salty, the crunchy and the chewy. My husband is like your husband. He thinks the above mentioned things should never be mixed. I feel your pain. I am excited to try this recipe, and will eat it all myself! I really don’t understand the “I don’t like fruit in my salad” which I’ve heard many too many times. This looks amazing. Have fun in France. I’m sure you’ll be thinking of us the whole time. I’ve just been wondering about cranberries, and then you posted this, so you get lucky enough to get the question: do dried cranberries always come sweetened? Is this because they are inedible without a little extra sugar? Or have I just been missing out? I say if you like something, make it and eat it. There must be plenty of times when your significant other or picky eater kids or whomever is/are not around… make sure you enjoy what you eat on those days at least…. This looks oh-so-good! I love crunchy nuts tossed together in a salad. Especially with the cranberries. On most days, I add currents into my food for the added sweetness. Hey neat, I made this recipe (well, kind of) this summer! Used halved grapes as in the original recipe, no walnuts, and substituted chopped water chestnut for the celery. It was completely delicious, the tarragon really makes it sing. (Even though I fretted about it, due to my I-hate-all-things-to-do-with-licorice stance.) For the tarragon vinegar, I just soaked a few pinches of dried tarragon in rice wine vinegar (mildest kind I had) for a while, and it worked a treat. Must try it with nuts soon! I think the cranberries and walnuts sound great, but I HATE mayonaise. Like the smell alone makes me gag, and so does the thought of eating something that consistency. On the rare occasions I make chicken salad, I use really good quality ranch dressing, with celery and and carrots. To me chicken salad needs crunch. I would totally eat that. I wonder, what does Alex adore that you hate? And do you prepare it for him anyway? I am always searching for a good chicken salad. This looks super yummy! @Libitina, cranberries are available in the fall and winter in the produce department, fresh and unsweetened. They are EXTREMELY tart. However, if you want to use them, you can buy a bunch of bags and freeze them. They keep really well frozen, right in the bag they came in. @Deb, why not make up a big batch, and take out some for Alex before you put in the things he doesn’t like? That would call for only one extra container and maybe make him happy too. Your salad sounds really good as is, but I love most chicken salads except those made with the nasty-sweet, faux-mayonnaise salad dressing (you know what I mean). Since the cafeteria at work is closed, I try to prepare my lunch (and my colleagues’) so I’m always looking for new salad recipes. This one looks really good, I’m sure I will try it before next week! I have been reading your blog since I saw you on Martha Stewart and I have to say I really love it! I know what your saying about making food only you will eat. I really hate to throw food away so it was great when my son was back home for a little while because I never threw it out! Grumpy and I have very different tastes and he doesn’t like mexican food but I love it! This is almost exactly like what I call my ‘Waldorf Chicken Salad’ that I always make with leftover roast chicken. Just sub raisins for the cranberries and add a bit of chopped apple and maybe some wholegrain mustard instead of some of the vinegar for some zing. I too am paranoid about having too-dry chicken. I’ve taken a hint from Ina and started roasting bone-in, skin-on chicken breasts (or whatever parts you like) for salads if I’m not using leftovers. Lucky me – my “other half” likes pretty much everything I ever cook. The only ingredients he refuses to eat are fennel and brussels sprouts – I think I can live with that ;-). But even if he were more picky, I think I would never stop cooking my favourite things… Anyways, your chicken salad looks really yummy! I am completely fed up with trying to cater for my veggie husband – so I cook my dinner and he cooks his! We’re most usually eating at separate times anyway but if I do a fry up or something similar on a Sunday morning he has to put up with the fact that there’s bacon in the pan with his veggie sausages, or he can cook it himself! that sounds like my husband! It’s hard when you both like such different things! This still looks fantastic though! Congrats and have some Paris for me! My husband hates mushrooms and I LOVE them *sigh* I rarely buy them anymore…the mere sight of them makes him cringe. Say bonjour to Paris for me. funny, but i make my chicken salad almost exactly the same way, except that i always add a little onion — and it is the only way that i really like my chicken salad too! I hear you, though if i was anywhere near a plate of lox or whitefish, I’d be in sheer heaven. 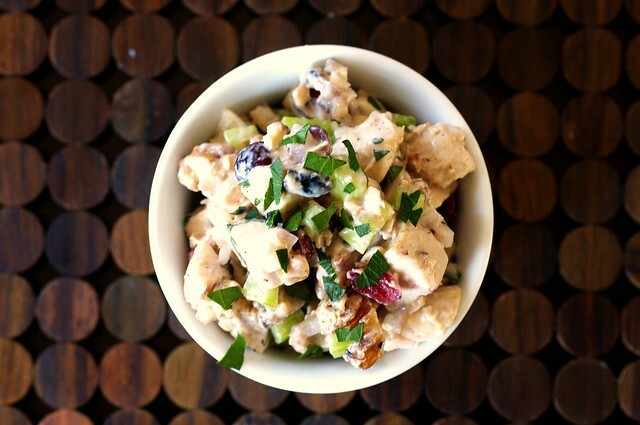 I make a similar chicken salad, but am not a cranberry or craisin fan….. I use red grapes, halved. My husband feels exactly the same way regarding chicken salad, but hardly ever eats with me anyway, so I get to make whatever I want most of the time! I’ve got a killer recipe with celery, sliced almonds, halved grapes, scallion, mayo and vanilla yogurt. Yum Yum Yum. I will try this one out because I love the idea of the tart/sweet cranberries! Isn’t chicken salad great? It’s so adaptable. I like mine with grapes and sliced snow peas… and I have leftover chicken in the fridge… this is starting to sound like a plan! I agree with your husband, though I WANT to like it like this. This is close to the only way I’ll eat chicken, at all. YUM! My hubs calls this “chick food”…suitable only for a ladies tea. Clod. Definitely a common theme in my house too! My other half would recoil at having a salad (just a salad?) for dinner. He also doesn’t like risotto or blue cheese. !!! I LOVE this chicken salad. And so does my boyfriend and so do many of his friends (men). We actually just had this for lunch on Sunday and dinner last night. It is our go-to chicken salad, most others are just too bland. We also add grapes if we have them in the house. Delicious! Ugh. What is it with picky men. My boyfriend hates fruit in salad too. The way I see it, that constitutes an uninvitation to dinner. Hilarious – I’m going through EXACTLY the same thing with my partner right now, and one of his aversions is also tofu!! I don’t believe that he doesn’t like ANY tofu, I think he’s just convinced himself of that…so I’m doing a “Tofu Tribunal” to beg/trick/force him into eating tofu until I can find at least one dish that he likes. So far: not going well. It is frustrating though, isn’t it? Because of him I get no squid, soy, seafood, smoked anything….sigh…. Wow, this looks fabulous! I may try it (with Morningstar Farms strips) in place of my standby not-so-chicken salad recipe. This is a little more fall-like; the one I usually do involves celery, halved purple grapes, and sliced almonds. You say I can substitute leftover turkey and pecans after Thanksgiving. I tell you I WILL be doing exactly that. This looks delicious. Thanks. The Boy does not eat beef or pork (I can live with that, mostly); lobster (and he’s from Maine! ); beets (I mourn the chiogga ones especially); or zucchini. This last one especially gets me because I adore zucchini. One of the upsides of being a freelancer, though, is that you can make for yourself for lunch what your co-diner won’t eat for dinner! Oh, that sounds wonderful. I’d join you for chicken salad in a heartbeat! Yum! This is very much like my mom’s recipe, except she does apples instead of cranberries – I may have to try this variation! Hope you are having a fabulous time in Paris! An absolute classic and one of my favorites as well. I have the opposite problem. My husband will eat lots of things, but the few things he refuses are sort of cornerstone things: no eggs (there goes half of brunch) and no lunch meats (hello tuna and chicken salad). so thanks to his taste preferences for lunch, I have found myself experimenting with more variations on the chicken salad than I can even count. I like it with grapes and herbs. I like it with walnuts and cranberries. Thyme and curry is one of my favorites. HoneyB, are you saying your Significan’t Other doesn’t like Mexican food? Where I’m from, that’s grounds for divorce!! I have a recipe almost identical, except it uses rosemary and grapes (and vinegar is optional). It’s awesome. Chicken salad with fruit and nuts is the only way to go. This is one of my favorite autumn lunches. I’ll have to try out your recipe–I love cranberries in meals, but never raisins! That looks delicious and I, like you, also like both salty and sweet things with my chicken salad. My own personal favorite style of this is a pesto, green grape and toasted pine nut chicken salad. It has a lot of the same elements as this one, but perhaps the flavor of it won’t be so repulsive to your other half? WOW – You read my mind – This is the exact way I love my chicken salad! As I sit here in my office starring at your picture… I am starving. This is excellent. How long will it keep in the refrigerator? I ask because, having no significant other, I cook primarily for myself. And it’s hard to justify something large unless I can freeze portions of it. Somehow, this doesn’t seem freeze-friendly. This looks yummy! But don’t poach your chicken, roast it! I know you like Ina Garten, and this is how she does it. Bone-in, skin-on breasts, roasted in the oven with olive oil, salt and pepper until they’re *just* cooked. Plenty moist, and more flavorful than poached! Ooh I love chicken salad! I totally agree with roasting the chicken :) In fact, that’s what roast chicken leftovers were meant for! I like the idea of cranberries in it, kind of reminds me of Thanksgiving. I hate hate hate mayo… So I use greek yogurt instead. As of late, I used left over chicken from my weekly roast with grapes. Delish! I have this problem EVERYDAY no matter what I make as I have the pickiest husband alive. That is why I dine alone and cook for myself and blog all about it. Deb, your NY-Eastern European-Jewish-style foods are soo appreciated! My parents grew up in NY, but moved to Dallas when I was born. Your chicken salad and so many other dishes are foods that I found only in my mom’s kitchen. Thank you so much. Hope France is fab! I am so lucky…my hubby is a very smart man. Even though there are a number of things he says he dislikes, he will eat anything I put in front of him. He loves a salad meal, and I try to include some kind of fruit any time I can. Married to him for 40 years, my philosophy is, try not to include too many things he doesn’t like in a single meal, and let him pick out anything he doesn’t want to eat. It’s amazing how many things he likes now, and how many others he’s just too lazy to pick out! This looks DELICIOUS. I am totally going to make this next time I have leftover rotisserie chicken or turkey!! Oh, I feel your pain. And then some. My significant other is the pickiest eater – not only does he not like tofu (one of my favorite foods) he likes only 1 or 2 vegetables, and won’t go anywhere near some of my favorites, like squash, tomatoes, or spinach; dislikes beans (such as, black, pinto, etc.) and is allergic to most fruits. We eat a lot of meat and potatoes! I’ve learned to make what I like and eat it for lunch for an entire week, or stick to things that freeze well. This is perfect in my eyes too although I am one of those weirdos who actually likes a little curry in my chicken, with big fat grapes and some toasted cashews. I could, however, eat chicken salad almost anyway unless it’s so saturated in mayo that you can’t tell what it is. I don’t often skip making something because someone won’t eat it; I’m not that selective. If I want it, I’ll make it. If no one else likes it that’s their problem. I thought I was lucky in the partners taste department (except for the peanut allergy, but let’s not go there), until wandering through the fruit shop I realised that there are alot of items that we just don’t eat. So, on a whim I bought some radishes, much to his disgust, then turned them into a salad (with apple and coriander) which he grudgingly ate, only to later admit that, you know maybe he did like radishes after all. I do not like dry chicken either. I like to use the Silver Palete method…baked in heavy cream. Ok, it probably runs up the calories, but O! that chicken is so tender & juicy – perfect for chicken salads. Will you please make crepes? I’ve been making them for years, but would like to see/hear what you have to say about them. Yum! 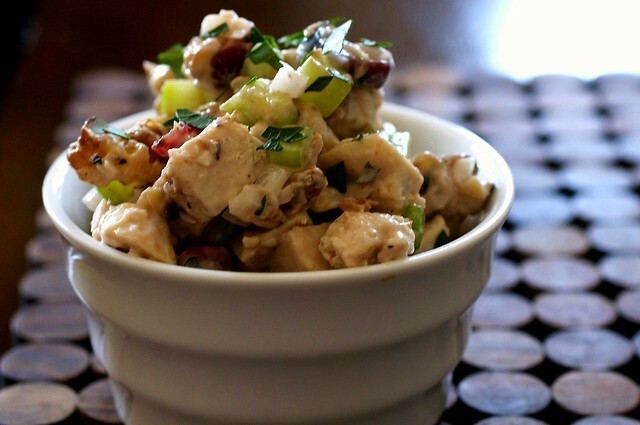 This looks like a great version of chicken salad! I love when chicken salad has walnuts in it. Hope you are having a great vacation! I love Paris. Took my honeymoon there and ate my way across the city! Yum! This looks delicious and seems like a perfect go-to recipe. Well, I finally figured it out. I think. If I want to eat something that I like, I would make something that he likes two days before, but with an extra portion that can be kept in the fridge. Like lasagne or beef pot pie without baking the top yet. Then I get to cook my stuff in peace and grace! Think this would work for you too? This is my kind of chicken salad! And as far as making certain foods, I tell my family that they will learn to like it. I know I have good taste! (No one on my husband’s side of the family will eat nuts…. it makes me crazy!). Hi! I’m a long-time lurker, first-time commenter, and I adore your site. My beloved fiance has a wide range of increasingly bizarre food aversions. (For instance: anything with mayonnaise, anything with cream, and (get this) cold foods. Seriously.) Suffice it to say there is a wide range of dishes I can only cook for myself. My solution is to make them for lunch and schlep them to work in a tupperware. I have found there to be little in life to rival the selfish, solitary pleasure of eating exactly what I want for lunch. Oh, and one other thing: I thought I hated spices in chicken salads too, but only because they’re usually plunked in raw. After reading Elise’s tip (http://www.elise.com/recipes/archives/001553chicken_curry_salad.php) to cook the curry powder first, I’ve never looked back. Okay I really need my coffee, why in the world did I think I read Texas although there is a Paris,Texas. I’m so jealous…enjoy all that the city of lights has to offer. OH MY YUMMY GOODNESS!!!! Thank you for posting this! I can’t wait to make it!!! Plus your photos always impress me…. amazing! Love your site! Oh, this looks heavenly! I can’t wait to try it. I’m always struggling with a good chicken salad. I had a friend who made it with chicken thighs, sweetened coconut, chunked pineapple, almonds, Miracle Whip, and some other ingredients. I adored it but have lost touch with the friend and the recipe. Oh yeah, with 4 others in the family, I give them each one veto to use during the week for a meal. They then eat leftovers, and I know for at least 6 more days, they will try to eat everything else I make. Compromise, my way! They then figure out if it is something they truly abhor, or something they just don’t prefer. Wow! This looks so yummy! It’s making so hungry for lunch! Thanks for giving me new ideas for lunch and dinners! I LOVE chicken salads. My husbands thinks NO fruit should go with anything savory. How he’s missing out! I hate onions. He loves them. I will NOT cook with them, he has learned to live with my delicious food without onions! This chiciken salad looks SO good! I agree with you on the “crunchy, sweet and salty, juicy and tangy,” but I hate dried cranberries and celery. Celery is the bane of my chicken-salad eating existence–restaurants always add it. I’m a big fan of apple and/or grapes in my chicken salad. Walnuts are good, but I like almonds more. I’ve never tried dried cherries in it, but your addition of cranberries makes me consider doing it. Alex needs to give coconut a chance. I think everyone who says they don’t like coconut has just never had good coconut, or real coconut, or doesn’t like the texture, and they just think they don’t like coconut. I refuse to believe anyone can legitimately dislike coconut! I never make things that my husband doesn’t like for fear that I will eat the entire batch of whatever it is! Cooking for one is just hard – which is the problem a lot of my single girlfriends have. My family is the same way. I make myself those foods they do not like, for lunch. They get to eat whatever left-overs are around. Oh, no! DH doesn’t like tarragon! Fuhgetaboutit! I love this! Thank you Deb! I do want to say, though, that recently I’ve converted to shredding the chicken instead of cubing it. I know it takes forever, but it really gives you more yield and a greater surface area for the ingredients. I learned long ago while my husband was in the Navy to cook just for me.He was often away or had duty. I like to try new recipes and he likes meat & potatoes. I love anything with chicken. I can’t wait to try this one. I find combining fruit and chicken is especially delicious. Most of the sweets I make I give away to friends. Hubby will eat the basic of basic things. I make a ton of chicken salad (just for me). I love the flavor it up by adding curry. Your version looks amazing. Be thankful your hubby eats most of what you make….. The poached chicken came out extremely moist. I’m saving the “broth” for something else, it’s really good too. As far as the salad, the flavors are delicious, but it’s too much mayo for me (and I only used 2/3 cup). I guess I have to acknowledge I only like mayo in VERY small quantities. Any suggestions for how to substitute for the mayo, with something besides dairy? I picked up a recipe very similar to this from a friend at work with halved red grapes and toasted sliced almonds. Soooo good! And hey, this stuff keeps great, so make yourself a batch and enjoy it for lunch when the other half’s not around! I so agree. I hear all too often that even their favorite dish is never made due to the mates preferences. Life is too short to go through it without things that we love. This salad looks very good. I can’t wait to try it. I happen to be the pickiest and most allergic member of the family, but I typically manage to find substitutes or omit ingredients that are going to cause problems. I would have used dried cherries or ordinary grapes instead of the cranberries in this salad (cranberries are a migraine trigger for me). Isn’t a recipie really more of a suggestion than a rule? my mother is in paris this week too! Huh. I’m afraid you just called me out… and interestingly enough, I’ve always wanted to try cranberries in my chicken salad but my husband says no. Of course, this isn’t the ONLY thing I want to try that he vetos… but I think you’re right. I shall try it (without walnuts). I went through an anti-mayonnaise phase in my youth, and to make up for it, I’m now NUTS for anything with mayo in it! I am therefore a chicken salad freak, and promptly made this recipe last night, and just had it for lunch. YUM! My new favorite recipe. I added parsley, because I didn’t have taragon, and loved it. LOVELOVE this salad! This is so much like my own, but I add some finely chopped sweet onions and substitute dill for the tarragon! I’m the only one in the house that likes it, but I still make it and bring it to work. There’s plenty of people there who will finish it up for me! So good! And my husband who doesn’t like my (earlier attempts at) chicken salad LOVED it! I made this tonight, without the walnuts because I don’t like them…because I’m a baby. Awesome recipe! Simply deliciosa! what a great recipe. i never ever have chicken salad but this is probably one of the best out there. i used dried cherries instead but who cares? i think any fruit would be good in this. thanks so much! This is wonderful! I really think that toasting the walnuts adds so much to the flavor, also. It’s an important step that I’ve never tried before. It really makes all the difference. I made this for the second time yesterday and it was decreed “the best chicken salad ever” by a chicken salad devotee. Thanks for keeping me on a great cooking streak! Oh, my god, this is good. I substituted dried tart cherries for the cranberries (thought I had cranberries… but was wrong). I wanted to eat THE ENTIRE THING. I love chicken salad w/ “stuff” in it.. except celery. Luckily, everyone in my house eats it (and my boyfriend even asked me, as he went back for his 4th mini sandwich, “How come your chicken salad is so good?!”). I don’t normally use mayo, instead I find softened cream cheese to be awesome. It makes it a little stickier, but it is so very tasty. I also throw in some blue cheese or goat cheese crumbles if we have them. This was just right. Loved it! Husband loved it, toddler liked it (yay!) and there was none left. This will be a staple for awhile! I have to admit the tarragon made me a bit leery (I don’t like licorice or anise flavor) but it added just the right kick. This is definitely a keeper. I just made the chicken salad tonight exactly as is. I used boneless skinless breasts and marinated in a brine just like you suggested. It was perfect. I did add a little plain yogurt to the dressing but ended up using about 2/3 cup total for the amount of chicken I had. It is absolutely perfect. I served mine in butter lettuce leaves and slices of garden tomatoes. And by served, I mean ate by myself in front of the tv….ha! Thanks for the recipe – a new staple for me. My favorite (or easiest) fruit to add to a chicken salad is mandarin oranges. It’s always on hand in my pantry (canned). I usually put in some pecans too. Minced onion and celery. I want to try your version too. It sounds like I’d love it. Can I tell you, I made this last night and I am now making it again! Best chicken salad I’ve ever tasted. My take: I reduced mayo (in my case veganaise) to 1/3 C and substituted pomegranate seeds for the cranberries. I just made a spin-off of this tonight with some leftover chicken. I added some sliced red grapes and celery salt. It came out deliciousm thanks for the inspiration! I really love this recipe but I use yogurt instead of mayo – I’ve disliked mayo since childhood. Talk about picky eating… but yogurt is really yummy here! I just roasted a turkey and knowing that it’s challenging to make chicken salad for one without leftovers, here is what I did, knowing that I could enjoy it for lunch at work and not lose the freshness. Keep these ingredients in separate containers: Mince white meat, enough for several servings. Minced onion and celery. Chopped walnuts. Whole dried cranberries. Assemble these items in a container each day: 1/2 cup turkey, 2 heaping teaspoons onion/celery, 1 heaping tsp. walnuts, cranberries, 2 large TBS mayo or light salad dressing (which I prefer as it is a little more tangy), pepper. Blend when ready to make your sandwich. Just enough for one and fresh and yummy every time. I just made this (but omitted the celery and all things taragon related b/c I just don’t like celery or taragon) but I wanted to say that I used basil instead of taragon (and white wine vinegar) and it turned out really well. Great recipe! I can’t wait to try your Thanksgiving version! Just terrific. Made this for a party and it was a huge hit! Couldn’t find fresh tarragon so I used thyme and it tasted great. I’m actually making another batch today. This was excellent, love sweet and savory flavors. I never use tarragon so that was nice! I just made this yesterday and simply love love love it. I used half walnuts and half pecans (because I didn’t have enough walnuts) and I also used half dried cranberries and half raisins (because I didn’t have enough cranberries). It is so delicious. I’ll never make chicken salad any other way. I’m going to try this recipe tonight, so excited! Just one question, I want to poach the chicken but Im wondering if brining it will make it EXTRA moist, or will it be just as moist if I just poach and skip the brining? Thanks! I’m making my own version of this salad tonight and I LOVE this kind of chicken salad so much. I’m adding strawberries too. Fresh tarragon, using champagne vinegar. Serving with sourdough bread and strawberry shortcake for dessert. I can’t wait to eat!! I’m lucky my other half eats almost anything – just like me, although he’d eat a cheeseburger or pizza every night if I let him. I recently catered my future sister-in-law’s bridal shower and used this chicken salad as the main event. I served it on mini croissants. It was a HUGE hit! My fiance is always my taste tester, and even HE loved the chicken salad and has asked me to make it for home. I make this all the time. But I do several different versions of it. Adding Pineapple Tidbit’s that have been drained and Cranberries with the Walnuts is really good. Just made this and nearly fainted. Ohmygoodness it’s good. have now made this 3x since i found the recipe on your blog. Everyone LOVES it and most go back for more! my friend Eddie had 3 helpings on Xmas Eve :) Thank you so much for a gem that will stay in my recipe book forever!! i roast pecans instead of the walnuts and it’s so delish. This is so my ideal chicken salad. I have made basically this same thing but used grapes instead of cranberries, I will have to try the cranberries next time! Anyway I was reading how you like to eat this, and if you haven’t already tried it I’ll suggest my absolute favorite way to eat chicken salad: On a toasted everything bagel with bean sprouts. Mmm! I make my chicken salad almost exactly the same, except I use my Cameron’s stovetop smoker to smoke the chicken breasts, and I add some lemon juice to the mayo. I also use pecans sometimes, but the dried cranberries are absolutely necessary. I never brined my chicken before. Can you tell me how to do it? How many parts water, sugar, salt and other seasonings to use? Thanks. Wanna try this…looks delish! Enough for up to 1.5 pounds of cutlets. Dissolve 2 tablespoons table salt in 2 cups water in medium container or gallon-sized zipper-lock bag. Submerge cutlets, cover with plastic wrap or seal bag, and refrigerate 30 minutes. Rinse cutlets under cold water and dry thoroughly with paper towels and prepare as you normally would. I made this a couple of days ago to eat with pita, and it was great!! I had to use cider vinegar instead of tarragon vinegar, and I used chopped up rotisserie chicken. It gets better as it sits a day, too, which makes it a perfect make-ahead dish. Thanks for sharing! How do you brine the chicken? I am using chicken tender strips I have in the freezer. The word “brine” in the recipe is a link to a post with brining instructions. However, I also reposted the brining instructions 3 comments before yours, in #127. I love the fresh tarragon in this recipe. The champagne vinegar was a worthwhile investment and really brought the flavors together. I actually soaked my chopped tarragon in the vinegar until everything was ready to mix together to make my own “tarragon vinegar”. I substituted halved red grapes for the cranberries and served it over mixed greens- so tasty. I suppose I’ll try it with cranberries around Thanksgiving with left over turkey. I also appreciated the “complicated” directions. Thanks for sharing! I like that you have Tarragon, celery and shallots in it. I would have never thought of that. Very impressive recipes here, and again, exquisite photography and presentation. At first glance I suspected that may be fresh Sage leaf on top, which piqued my interest. I just made a batch of this for lunch. It is so flavorful! I ate it on top of a bed of spinach greens and sprinkled with oil & vinegar. Would definitely recommend! Just made this and it’s delicious! It was my first time brining and poaching and your instructions made it easy and the chicken is moist and good. I substituted some of the mayo with greek yogurt for a little healthier version with terrific tasting results. I also used champagne vinegar and since I love honey I added 1/2 tsp. Would definitely make again and recommend! Thanks for this great recipe! Chicken salad is something I got mad cravings for while pregnant, and I needed this recipe because I couldn’t eat food that was sitting out and wanted to make it with vegan mayo so I didn’t have raw egg. So much better when made from scratch anyway. If you are looking for a short-cut on the brining, etc., I HIGHLY recommend using the tasty and succulent Eataly rotisserie chicken. I know, you are thinking, how good can rotisserie chicken be? Please try it – it is THAT good and worth every penny of the price. You made some decent factors there. I looked on the internet for the issue and located most individuals will go together with with your website. Well if I have learned one thing from these comments is that I am going to tell whoever I marry to either eat what I make or make their own. ESPECIALLY if they are picky or consistently choose unhealthy food. Last time I checked, I wasnt a short order cook so if they don’t like it, they can make something for themselves. Picky eaters are my #1 pet peeve in life and I think it would even be a dealbreaker when it came to a guy! This looks good. I have tried variations of this but I never thought of adding vinegar. I’ll try that next. My only trick is that I use a 1/2 and 1/2 mixture of mayo and yogurt to cut the calories. Awesome! I used leftover shredded chicken from a crockpot, threw the ingredients together and VIOLA!, I’ve got lunch for the next few days! Ive never bought/used/tasted tarragon before, so that was interesting — tasty and interesting! :) This is a very gourmet chicken salad. And now I know what to do with Thanksgiving leftovers! This is a great chicken salad recipe. I have never even tried it with tarragon or tarragon vinegar and it’s still great. Oh wow. This plus some red grapes inspired an amazing dinner last night. It was so so so simple, but much fancier than traditional chicken salad. Thanks! The last time I made my “star” chicken salad was in Jan. ’94 for my daughter-in-law’s baby shower. Now, 9 years later we are having a 50th wedding anniversary lunch in late January. But, alas, the 9-year-old is allergic to nuts. . Nor can I use anything processed in a facility that also processes nuts unless good separation practices are observed which is always stated on the package. Any suggestions for added crunch to replace the nuts I can’t use that would be right for what we hope to be a very festive day? ( I already use celery and don’t care to add dried cranberries, too chewy (but not crisp) and too sweet). Very delicious. I omitted the nuts. I pickled the finely chopped celery (per your last egg sald recipe). Great chicken salad. Thank you very much. well, Deb, I always love all your recipes…but the vinegari-ness of this was too much for me (and I used a mild vinegar); added a touch of maple syrup for sour/sweet balance and used fresh zucchini cuz the celery was nowhere to be found. Having it with lettuce leaves from the garden (who cares!! haha) and some grainy bread, because that’s what we have! and all food groups are covered! This is seriously delicious. Made it tonight for lunch tomorrow and substituted cucumber for the celery since my yard is a cucumber factory. This was the third Smitten Kitchen recipe I’ve made in the past 24 hours, all great. Thank you! I just made this and followed instructions exactly (no tarragon to be found though). It’s amazing. I can’t stop eating it. I don’t cook and took the “east way out” (like there’s anything hard about this recipe) by using a rotisserie chicken and it is wonderful! The tarragon is really nice and I like the tang of the white wine vinegar (that’s all I had). This will become a year-round staple for me! My husband will eat just about anything I cook, I just have to be careful what I call it! Somewhere in his past he had beef stroganoff and hated it. If I say I’m making it he makes all kinds of faces and barely tastes it, complaining how he hates beef stroganoff! A month later I make the exact same beef stroganoff but I tell him it’s beef strips and mushrooms in a beef and sour cream gravy and he goes back to the pot not just for seconds but a third helping! Lol! He doesn’t know what he doesn’t like! So delicious to have with bread! Thank you–this was wonderful! i had to substitute dried tarragon (no fresh tarragon to be found), and poached the chicken in chicken broth. Yum! I substituted almost everything to use things I had in the cupboard: chopped mange tout instead of celery, red onion instead of shallot, raisins instead of cranberries, pecans instead of walnuts, fresh basil instead of tarragon and cider vinegar instead of champagne/white wine vinegar. Is that a whole new salad?! Either way it was absolutely delicious, I would recommend the substitutes if you don’t have what you need. This is an awesome recipe. I subbed parsley for tarragon and used white wine vinegar, but otherwise made no changes. Super delicious, can’t wait for the chicken to get cold (I don’t particularly like hot and cold mixed together) so I can put it on romaine and eat it up! Your blog is the best. I am not a big fan of chicken, I just little transformed the recipe into a vege. so i just take paneer (A milk Product- A vegetarian chicken) instead of chicken. I like the taste and the recipe and different from panner-tikka which is also nice. This is an amazing recipe! I used greek yogurt instead of mayo for a lower-cal version and used grapes instead of cranberries because that’s what I had. Really really delicious. You never steer me wrong Deb! Is it a terrible idea to use an already cooked rotisserie chicken?? I just always love how flavorful they are — AND its already cooked! This turned out so good, I’ve made it a couple times now. I did make a couple substitutions and additions in this and it still turned out amazing (i did figure out that you can’t skip the vinegar, it tastes real weird without it)! I added grapes and avocado, had to use dried tarragon (no fresh to be found), white wine vinegar and I left out the celery, as I’m generally not a celery fan. (I think next time I will try subbing waterchestnuts mentioned above). I topped with some blue cheese crumbles and served over spring mix with a balsamic. So great! I’ve been stealing several of your recipes for a work lunch club (we switch off every week making a home-cooked meal for each other) and just made this chicken salad, which has made me finally post. It’s delicious! There’s a gourmet deli in Washington DC that has a fall special of a similar chicken salad with brie, bacon, and granny smith apple, which is fantastic. Now I can make it on my own! I made this using Deb’s Buttermilk Roasted Chicken recipe and it was soooo good! I also used 1/4 cup mayo and 1/4 plain Greek yogurt for the dressing. Delicious lunch for the week! This is delightful. I have also never brined anything before and had no idea it was such an easy process and will always do this from now on. I’m having it on crackers with your kale salad with pecorino and walnuts. Cheers! This was great! It got rave reviews by all at a party. I put it on Martin’s potato buns with arugula and some more mayo. This is so yummy! I made it as written and with chopped apples and red seedless grapes. The tarragon really makes this special. Thank you again for a great recipe. This was wonderful, we had it for dinner tonight on fresh spinach. However, the one thing that we felt was missing was a little juicy sweetness. I cut a crisp medium apple into small pieces (1/4″-1/2″) and that did the trick. I’m guessing that grapes or grape halves would also have a similar effect. Beautiful chickens on sale today at the open market! I bought two and threw them into the oven. One was eaten immediately by my appreciative family and the second one became this delicious salad. I really do not understand the idea of soaking pieces of raw chicken in salt water. It sounds disgusting — and it is so easy to roast a chicken in the oven and have heaps of tender, moist, flavourful meat (plus the carcass for stock)! The salad is wonderful, many thanks! The lovely tarragon makes it very special and delightful, with the toasted nuts. I thank you for many SK recipes that appear often on my table. How long can this keep in the refrigerator?